We know that the hair textures and the sensitivity of the skin vary from person to person. But we may not have taken much notice of the fact that they also vary in different parts of the body in a same person. This fact may be well known but we may have ignored it while choosing our trimmers and may have been doing it with one trimmer all across the body, be it the face or the arms or the bikini area or even the legs. While legs and arms can be done away with any decent trimmer using that for the face as well as for sensitive areas like the bikini is not at all advisable. This is why some of the companies are coming up with special trimmers to tackle the hairs of these areas. 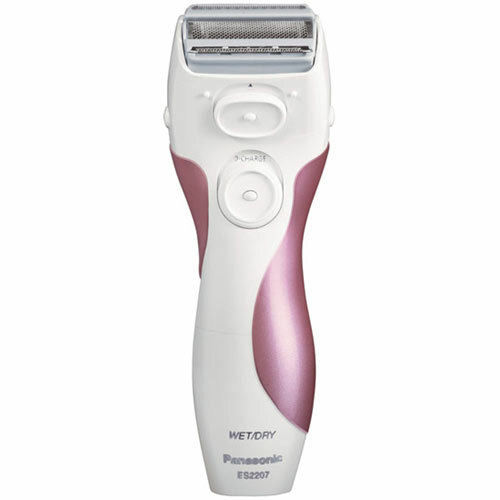 Panasonic, which has already made a mark in the grooming section, would not be left behind. In this article we would be discussing about the bikini shaper and trimmer from Panasonic, the ES246AC. This is a compact, rectangular shaped, light weight and highly portable, cordless travel friendly trimmer. The head is less than an inch and a half in width. It is super slim and can slip into a woman’s bag and is easy to carry around. The exact color of this product is difficult to describe. The plastic body has a light grey color with a tinge of mauve to it. The color complements her other beauty accessories when thrown into the bag. The head is slightly narrow compared to the rest of the body. 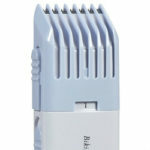 It has 5 grooves in its sides so that the trimmer comb can fit in easily. There are markings in the head corresponding to the grooves (1-5) which represent the trimmer comb settings respectively. The rectangular slim trimmer has a comfortable and anti-slip grip so that it fits into her hands comfortably and she does not have problems maneuvering it. The HEAD as we already discussed is narrower than the rest of the body and is angled at the apex where it end in the trimmer blades. 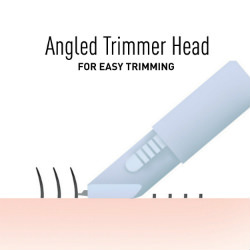 This angled head with rounded edges enable easy trimming and lets her glide the trimmer over her skin. The angled head can act as the base on which she can rest the trimmer while trimming to avoid direct contact of the blades on the skin. It can smoothly work around the bikini areas without hurting her or causing her any kind of discomfort. The trimming blades are made of stainless steel. They are super sharp and hypoallergenic in nature. They can take care of any type of hair in this region, from ultra fine to coarse. The trimmer blades can go real close to the skin with the aid of the angled head without causing nicks or cuts and can give her a close trim. The sharp blades snip off the hairs easily without pulling or tugging them while the hypo allergenic property avoids skin irritation. The head is accompanied with a trimmer comb which can be locked at 5 adjustable setting points if she prefers to keep the hairs to a certain length over a close trim. 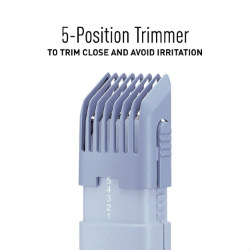 The 5-position trimmer comb can be slid over the head easily and can be adjusted with the help of the push buttons on its sides. The comb acts as a shaping guide wherein she can trim and shape the hair lengths according to her choice while the rounded tips reduces the risk of razor bumps to almost zero. The Panasonic ES246AC Bikini Shaper & Trimmer is powered by two AA batteries. She can even use the rechargeable ones so that the daily cost of buying batteries is cut down to a minimum. Having said and done, it has to be added that these batteries come at a very low cost and are easily available all over the world. The use of AA batteries makes it even more useful in long distance travels wherein she would not have to worry over the voltage compatibility of the adaptors. A pair of new AA batteries can provide up to 45 minutes of trimming time. This is great compared to the minimum time that the trimmer takes to do her job. Thus one pair can last a long time. And to be over precautious she can always carry an extra pair for hassle free uninterrupted use. Cleaning the Panasonic ES246AC Bikini Shaper & Trimmer is a rather easy task. 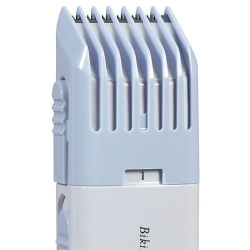 The trimmer comes with a cleaning brush which can be used to clean the trimmer blades of all the residual hairs. The Panasonic ES246AC Bikini Shaper & Trimmer has to be cleaned after every use to maintain the hygiene of the trimmer. It also increases the durability by preventing the blades from clogging. The Panasonic ES246AC Bikini Shaper & Trimmer comes with a two year limited warranty from the manufacturer. 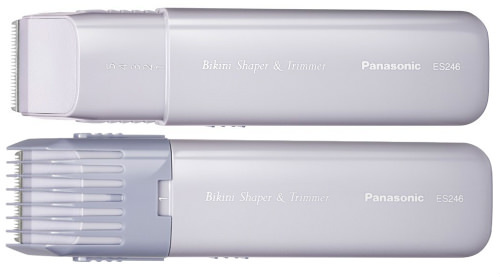 Though the Panasonic ES246AC Bikini Shaper & Trimmer has been reviewed as a very useful and handy bikini trimmer, many have complained that this trimmer does not last long. If the problem can be solved by replacing the head, then it’s readily available and comes at half the cost of the trimmer. But if it’s not so then she needs to go for a new one which is also so cheap that it can hardly be compared to the price of its competitors. So, if she doesn’t want to invest much but yet would prefer to keep a trimmer that takes care of her bikini areas and is handy, the Panasonic ES246AC Bikini Shaper & Trimmer is the one to go for.